The corresponding author has recently reported a technique for single incision laparoscopic subtotal gastrectomy with D1 alpha lymphadenectomy. We add to this experience by presenting the first case to be documented in the literature of a single port laparoscopic Billroth I gastrectomy with a hand-sewn intracorporal anastomosis. A 62-year-old lady presented with right upper quadrant and epigastric pain radiating round to her back. This was her fourth episode of symptoms and her pain was precipitated by fatty foods. She was investigated with an ultrasound and upper gastrointestinal endoscopy. Ultrasound imaging demonstrated a single large 2 cm gallstone in the gallbladder and was otherwise normal. However, on endoscopy a sub-mucosal swelling was found on the inferior wall of the stomach antrum [Figure 1]. In view of these findings, we performed an endoscopic ultrasound evaluation of the stomach and this evaluated the mass as being 56 mm at maximum diameter, slightly heterogenous and hyperechoic. No other abnormalities were found. Computer tomography confirmed a well-defined fat density submucosal lesion related to the gastric antrum [Figure 2]. Incorporating the clinical and radiological findings the differential diagnosis was either a gastric lipoma or gastrointestinal stromal tumour. 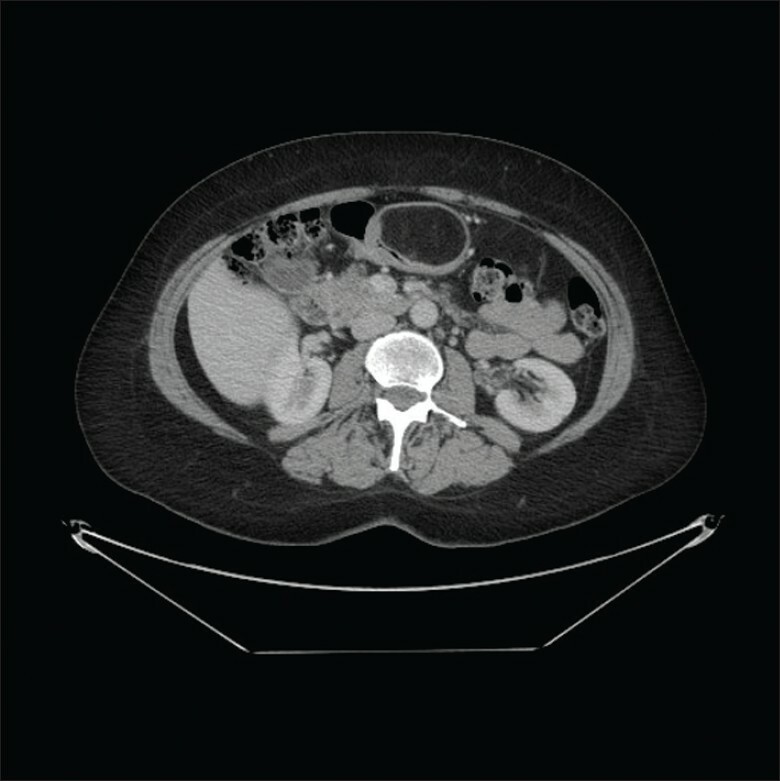 The patient was discussed at the regional multi-disciplinary team meeting with the consensus that a distal gastrectomy and cholecystectomy should be performed with a Billroth I reconstruction in order to maintain gastrointestinal continuity should she require further management of her gallstone disease through an endoscopic route. This was performed by a single port technique. The patient was placed in the Lloyd Davis position. An endoscopy was performed to confirm site of the tumour and demonstrated the mass to be abutting the pylorus [Figure 1]. An Olympus Quadport (Olympus Medical, Southend-on-Sea, Essex, UK) was placed using an open Hasson technique through a 30 mm transumbilical incision. The surgeon was positioned in between the patient's legs and the assistant on the right side. Off angle views were obtained by the use of a 10 mm high definition videoscope with flexible tip (LTF-VH Deflectable Tip Video, Olympus Medical, Southend-on-Sea, Essex, UK). Straight conventional instruments only were used throughout the procedure. The omentum was dissected from the transverse colon with a Harmonic ACE 36 mm (Ethicon Endo Surgery, J and J Medical Ltd, Wokingham, Berkshire, United Kingdom) to mobilise the greater curve of the stomach. The lesser sac was then entered and the lesser curve of the stomach mobilised both through dissection anterior and posterior to the stomach. The dissection included a limited lymph node dissection of the supra-pyloric, infra-pyloric, distal greater curve and distal lesser curve lymph node stations. The duodenum did not require kocherisation due to an abnormally long first part of duodenum. The proximal resection margin was at the proximal antrum and the stomach was divided with two fires of 60 mm laparoscopic stapler (Endopath® Echelon™ Flex 60 Endocutter, Ethicon Endo Surgery, J and J Medical Ltd, Wokingham, Berkshire RG40 3EW, UK) using gold (1.8 mm closed height) cartridges. The distal resection margin was at the duodenum, close to the pylorus using two fires of the same stapler, this time using blue (1.5 mm closed height) cartridges. A Billroth I reconstruction was created. The resection margins were aligned with stay sutures. All sutures used for the reconstruction were absorbable polyglyconate unidirectional barbed sutures (Covidien V-Loc™ 180 Absorbable Wound Closure Device, Covidien plc, Dublin, Ireland). The lesser curve was reconstructed by inverting the staple line with continuous suture and then an intracorporal hand sewn two layer end-to-end anastomosis was constructed with a continuous suture technique. A repeat endoscopy was then performed. The scope passed easily through the anastomosis into the duodenum confirming patency and then insufflation demonstrated no evidence of an air leak on laparoscopy. A standard single port cholecystectomy was then performed and both specimens retrieved with an Ethicon EndoPouch™ retriever bag (Ethicon Endo Surgery, J and J Medical Ltd, Wokingham, Berkshire, UK) through the umbilical incision. A small increase in the fascial incision was required in order to remove the gastric specimen. A nasogastric tube was left on free drainage and there were no abdominal drains. The fascial defect was closed under direct vision. The total operating time was 270 minutes. The patient was extubated immediately following surgery and transferred to the intensive care unit as a precaution. She did not require any inotropic or ventilatory support. Enteral intake was started on the day of surgery at 30 ml/hour sips of water and this was doubled on the first postoperative day. The patient was on a full diet by day 6. Analgesia was achieved with intravenous paracetamol requiring 1 g four times a day for six days. In addition on day 1, a patient-controlled analgesia pump of morphine was commenced with the patients' requirements being 17 mg, 25 mg, 11 mg and 5 mg on days 1 to 4, respectively. The patient had no complications in the postoperative period and was discharged on the eighth day. Follow-up demonstrated a good cosmetic result [Figure 3]. Histology demonstrated a gastric submucosal lipoma. In view of the benign nature of these findings a lymph node evaluation was not performed. The gallbladder specimen confirmed chronic cholecystitis. This technique in the first reported single port Billroth I gastrectomy described in the literature and follows on from the recent publication by our unit of a technique for single port laparoscopic subtotal gastrectomy with D1 alpha lymphadenectomy. There has been some controversy regarding the oncological practicality of laparoscopic gastrectomy, although recent review articles have demonstrated equivalent oncological resections and lymphadenectomy can be achieved with reduced surgical trauma, blood loss, pain and hospital stay. , Although, the case we describe was undertaken for a benign pathology we have demonstrated previously  that single port gastrectomy can achieve a safe resection, with the same oncological principals achieved by open and laparoscopic techniques. To date 4 single port gastrectomies have been attempted at our institution and 2 of these were converted intraoperatively. One case was converted to an open procedure as the tumour was not palpable laparoscopically and the other was early in single port experience and the anastomosis could not be performed safely without the addition of extra ports. For one to perform this safely, as described in our paper, the operating surgeon needs advanced laparoscopic experience, as well as being well versed in single port surgery and a pragmatic approach in consideration regarding the addition of ports or open conversion must be adopted. In its infancy, single incision laparoscopic surgical techniques were developed for the resection of tissue in procedures such as appendicectomy and cholecystectomy that do not require reconstruction. With experience, more complex procedures are being undertaken that require bowel anastomosis such as right or left hemicolectomy, gastrojejunostomy or the subtotal gastrectomy reported by us. ,, The constructive parts of these operations challenge the single port laparoscopic surgeon in view of the constraints of the technique, namely difficulty in triangulation, instrument crossover and instruments clashing with the camera. , However, as technology improves more complex procedures can be performed safely by single incision with techniques becoming more mainstream, as shown by the flexible tipped camera and unidirectional barbed sutures facilitating the hand-sewn, 2-layer intracorporal anastomosis that was created between the gastric remnant and duodenum. This technique of laparoscopic hand-sewn anastomosis provides a comparison to reports from the Japanese literature where the management of early gastric cancers by Billroth I gastrectomy and stapled anastomosis is favoured. Intraoperative endoscopy is a safe and reliable way to ensure anastomotic patency and confirm that there is no leak. Laparoscopic surgery carries an inherent learning curve. It is well recognised that in laparoscopic cholecystectomy and laparoscopic fundoplication operating time and postoperative stay reduces as the experience of both a surgeon and institution increases. , Therefore, we remain reticent regarding the length of surgery and postoperative stay in this case, as we expect this will improve in future cases. We do not seek to illustrate that this should become a mainstream technique but that it can be feasible with the appropriate operating surgeon and patient selection with potential benefits from reduced port-site complications and cosmesis. 1. Strong VE, Devaud N, Karpeh M. The role of laparoscopy for gastric surgery in the West. Gastric Cancer 2009;12:127-31. 2. Chow A, Purkayastha S, Paraskeva P. Appendicectomy and cholecystectomy using single-incision laparoscopic surgery (SILS): The first UK experience. Surg Innov 2009;16:211-17. 3. Remzi FH, Kirat HT, Kaouk JH, Geisler DP. Single-port laparoscopy in colorectal surgery. Colorectal Dis 2008;10:823-6. 4. Bucher P, Pugin F, Morel P. Transumbilical single-incision laparoscopic intracorporeal anastomosis for gastrojejunostomy: Case report. Surg Endosc 2009;23:1667-70. 5. Ozdemir BA, Thomas RL, Soon Y. Single port laparoscopic subtotal gastrectomy with D1 alpha lymphadenectomy. Surg Innov 2011;18:NP1-4. 6. Hayashi H, Ochiai T, Shimada H, Gunji Y. Prospective randomized study of open versus laparoscopy-assisted distal gastrectomy with extraperigastric lymph node dissection for early gastric cancer. Surg Endosc 2005;19:1172-6. 7. Huscher CG, Mingoli A, Sgarzini G, Sansonetti A, Di Paola M, Recher A, et al. Laparoscopic versus open subtotal gastrectomy for distal gastric cancer: Five-year results of a randomized prospective trial. Ann Surg 2005;241:232-7. 8. Omori T, Tanaka K, Tori M, Ueshima S, Akamatsu H, Nishida T. Intracorporeal circular-stapled Billroth I anastomosis in single-incision laparoscopic distal gastrectomy. Surg Endosc 2011;26:1490-4. 9. Hawasli A, Lloyd LR. Laparoscopic cholecystectomy. The learning curve: Report of 50 patients. Am Surg 1991;57:542-4. 10. Gill J, Booth MI, Stratford J, Dehn TC. The extended learning curve for laparoscopic fundoplication: A cohort analysis of 400 consecutive cases. J Gastrointest Surg 2007;11:487-92.